Trump outside the firehouse in Annaville, Corpus Christi. • Heavy rain from Tropical Storm Harvey continues to pound southeastern Texas, parts of which have seen around three feet of precipitation. The National Weather Service expects another four to six inches to fall through Tuesday, from Houston to southwest Louisiana. Between 7 and 13 inches more rainfall will drench the region by the week’s end. • A staggering 50 inches could fall by Friday. Houston has exceeded its average annual rainfall, and August 2017 is officially the wettest month on record. A preliminary report from a rain gauge south of Houston measured 49.32 inches of rain, breaking the record for rainfall from a tropical system. • Harvey’s death toll has risen to 12, including at least one police officer. That number is likely to rise once teams search homes and other flood-ravaged neighborhoods. At least a dozen have been injured as a result of the storm, which crashed into Texas as a Category 4 hurricane on Friday night before weakening. • Aerial photos of the city, as well as other images, captured the scale of some of the devastation. • Rescue and evacuations are still underway across Texas, and have extended to parts of Louisiana, as rivers in the region are overflowing. More than 9,000 people have sought shelter in the George R. Brown Convention Center in Houston, almost double its capacity, with more people arriving by the minute. Officials predict more than 30,000 people will seek shelter. Officials said that emergency responders had rescued more 6,000 people as of Tuesday morning. • Houston’s George Bush Intercontinental Airport remained closed to commercial flights until further notice. Many Houston-area schools postponed the start of the academic year by at least a week. 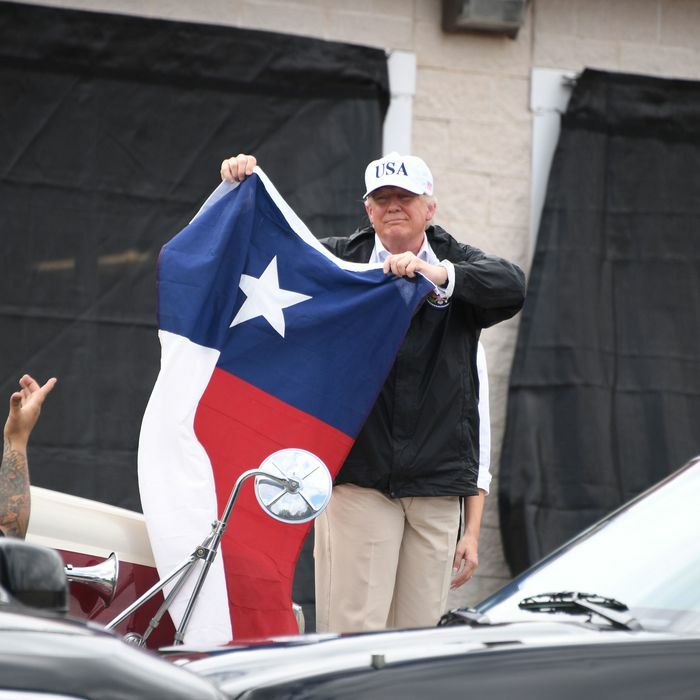 • President Donald Trump has decamped to Texas, where he visited Corpus Christi, close to where Harvey made landfall, and Austin, the state capital. He avoided the emergency zone in Houston. He has said he may return to the region and visit Louisiana and Texas this weekend. Donald Trump and First Lady Melania Trump arrived in Texas Tuesday afternoon to survey the disaster in Harvey’s wake. They avoided the Houston metropolitan area, which remains an active emergency zone and continues to be inundated by rain, rising floodwaters, and overflowing rivers and reservoirs. Instead, he visited Corpus Christi, which is about 30 miles from the hard-hit Rockport, Texas, where the Category 4 hurricane touched down Friday. “What a crowd, what a turnout,” he also mused. The president later headed to Austin, where he will once again be briefed by officials, and he’ll meet with some local leaders and members of Texas’s congressional delegation, in addition to visiting the command center for emergency operations. Trump to Ben Carson about the name "Harvey": "Sounds like such an innocent name, Ben, right? But it's not innocent. It's not innocent."